Duet is releasing on August 25!!! Can you believe it's almost August already? I read about the other authors mentioned and consider myself to be in some amazing company. There will be other similar posts in the future, so if you have a favorite new writer you'd like to see get the recognition they deserve get on over there and submit their information. Thanks go to Feliz for nominating me, and saying such nice things about my work. The English -- an evil not to be tolerated, or so Aillil Callaghan believes, and the Kentish tutor his father brings to the Highlands to teach his younger brothers the ways of the conquerors is no exception. 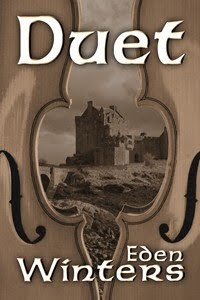 Malcolm Byerly has nothing but charm, music, and affection to win over the skeptic who wears the forbidden kilt, yet the sound of the violin brings them together. Scarlet fever respects none, and their budding love can’t stave off fate. Is death the end, or will the help of a Druid priestess make it a new beginning?